My seventh ground of 2017 was at Stompond Lane in Walton-on-Thames, Surrey. 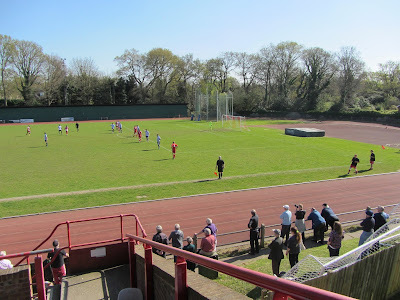 The match was Walton & Hersham vs. Camberley Town in the Combined Counties League Premier Division. Stompond Lane was the primary part of a sports complex nestled in a residential area with housing bordering the venue on the southern and western side. There was an athletics track encircling the pitch and Walton Tennis Club also shared the venue with a number of courts behind the eastern end of the football pitch. Stompond Lane was half a mile north of Walton-on-Thames railway station. 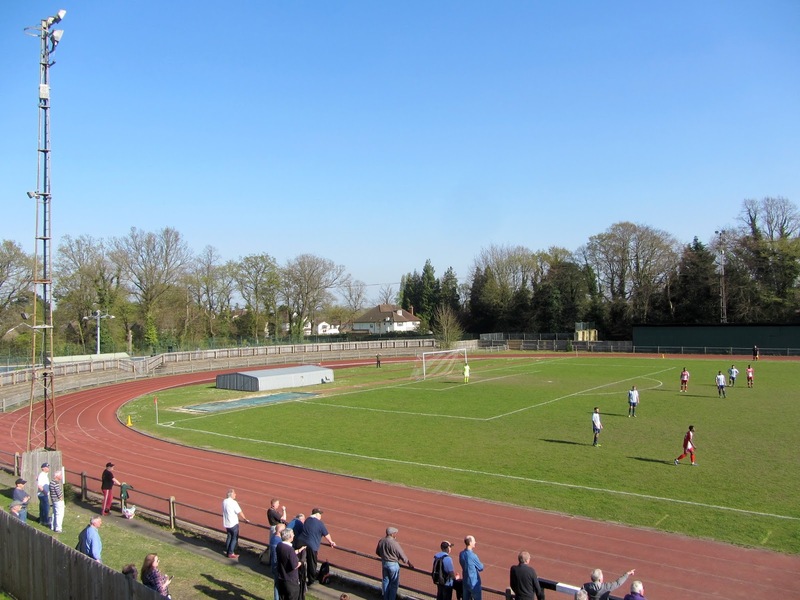 The club left the venue in Summer 2017 to move into the Elmbridge Sports Hub which they share with Walton Casuals. 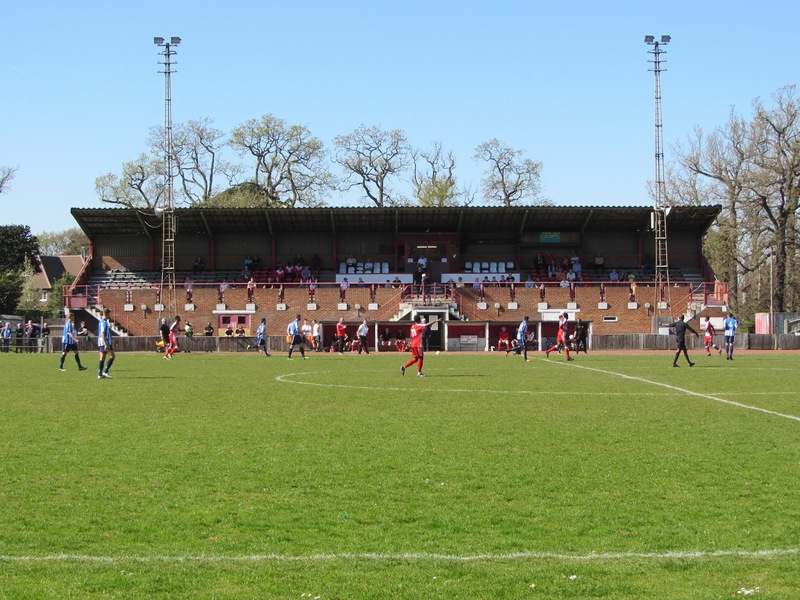 The Stompond Lane ground is now in the process of being demolished and replaced by housing. At the entrance to the ground there was a building with a bar and club shop with a concrete mini-pitch in front of it. There was also a shipping container just beyond this which acted as match programme outlet. The main stand was a brick structure which was raised up above the athletic track below. The interior of this stand housed the dressing rooms. There were 7 rows of wooden benches which were been attached to concrete. Plastic seats had then been added on top of the benches. There would have been 380 seats to start with but a fair few of these were missing by the time of my visit. In the middle of the stand there was a section carved out for officials with a media box at the back of this. Either side of the stand there was a small grass bank behind a strip of concrete for fans who wanted to be closer to the pitch. The opposite side of the field used to be taken up by a covered concrete terrace which ran the entire length of the field. This stand had fallen into disrepair and concerns over its structural integrity resulted in its closure while the ground was still in use. When I attended the old stand was boarded up leaving a very thin walkway which was not really an area for spectators. It did technically provide the only other covered area in the ground with the old stand's roof extending over the athletics track. Due to the track the two ends were a distance from the action - the eastern end retained a curved concrete terrace which was six rows high at its peak. The western end had narrow concrete walkway which curved round and there were houses directly behind this. Some of the fencing around this end the ground had collapsed as further evidence of the venue's slide into disrepair. The first goal didn't take long to arrive as in the 6th minute a Walton ball over the top found a Camberley defender but he slipped trying to clear it. TJ Nkoma reacted quickly to run in on goal and stroke the ball past the keeper to give the hosts the lead. Walton were well on top in the early going and Sivari Norman in the away goal produced two good saves from close range volleys in the opening 12 minutes. After this rocky start Camberley stabilised and restricted Walton up until the 35th minute when a well weighted through ball put Francois Gabbidon in on goal but with only the keeper to beat he shot wide. Just before the break Gabbidon went close again after Malachi Thomas was let loose down the right wing, crossed into the six yard box and Gabbidon just missed getting on the end of it. Early in the second period another long ball caught the visitors out as Jamil Okai picked up the ball but in a one-on-one situation with the keeper he failed to hit the target. Eventually this inability to deal with Walton long balls was punished as in the 63rd minute Howard Newton was left up against Norman but he noted the keeper coming out to meet him and lobbed him from the edge of the box. In the 69th minute the woodwork denied Walton a third goal when Malachi Thomas curled his free-kick onto the top of the crossbar. In the 72nd minute the hosts did get the ball in the net thanks to Matt Rose-Hazel but it was ruled out for offside. Jamil Okai also went close in the final ten minutes with a 30 yard effort which fizzed over the bar but Walton were unable to add to their total against a Camberley side who offered little over the 90 minutes.